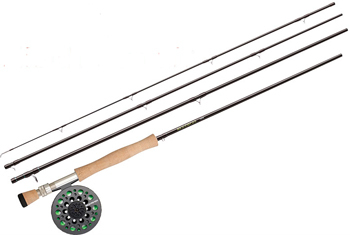 The Redington CHROMER spey/switch fly rods are the ultimate tool for the two-handed angler. With refined rod actions to suit a variety of casting and line styles, the rods also feature custom polymer gripping sections on the top and bottom handles. The Redington CHROMER spey/switch fly rods are the ultimate tool for the two-handed angler. With refined rod actions to suit a variety of casting and line styles, the rods also feature custom polymer gripping sections on the top and bottom handles. These unique pinch grip sections allow for easy running line management during spey casts and added comfort over a long day of fishing. With three switch, and five spey models, we offer a size for any steelhead or salmon fishing scenario. * Please remember, if you decide to "Make this an Outfit".....simply purchase a reel and a line and tell us which hand your retrieve the reel with. We'll load up the reel properly and the backing will be on us! Click the "Outfit" tab above for more details.